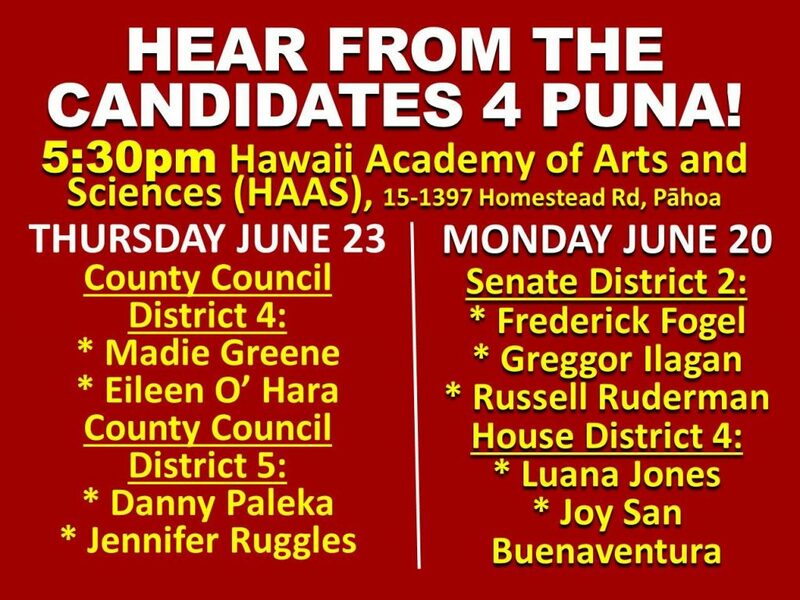 Monday, 6/20/16 The Hawaii Academy of Arts and Sciences (HAAS) in Pahoa will be hosting 2 candidate forums this week. The first forum will be today from 5:30-8pm. Candidates for Puna’s Senate District 2 seat. Candidates Frederick Fogel, Greggor Ilagan, and incumbant Russell Ruderman will attend. Hawaii House District 4 candidates Luana Jones and incumbant Joy Sanbuenaventura will speak. Thursday, 6/23/16 The second forum will be 5:30-8pm. Hawaii County Council District 4 candidates Madie Greene and UH Hilo professor Eileen O’Hara will speak. Hawaii County Council District 5 candidates Jen Ruggles and Danny Paleka will also speak. HAAS is located at 15-1397 Post Office Rd, Pahoa, HI 96778. For HAAS website click here. If you cannot make it to this one, there will be plenty more coming up and we will keep you posted!